NEW YORK, June 4, 2012 -- Sony's VAIO® Expo Tour at the Sony Wonder Technology Lab in New York heralded the brand new VAIO T Series Ultrabook™ as well as a new portfolio of VAIO PCs built with Sony's industry-leading audio, video, imaging and software technology. The first Ultrabook to carry the VAIO name, the T Series packs high performance and responsiveness into a stylishly slim magnesium and aluminum chassis for daily trips to the office or campus. Also in the VAIO family are enhancements to the E, S, Z and L All-in-One Series models, incorporating advanced features and a platform of innovations for all around excellence in productivity and entertainment. "Thin and light is nothing new to Sony – we built the T Series Ultrabook from many of the same features as our amazingly thin and powerful ultra-premium VAIO Z Series, which has long exceeded Ultrabook specifications," said Mike Abary, senior vice president of Networked Technology and Services Division of Sony Electronics. "Our entire new VAIO portfolio incorporates the best technology from our innovative digital imaging, sound and TV divisions and unique features across all the models such as backlit keyboard and Sony's Rapid Wake technology. The new VAIO family continues Sony's efforts to offer advanced performance and design that fit all business and personal lifestyles." The new VAIO T Series Ultrabook is the ultimate travel companion designed from the ground up to deliver intense performance and extreme mobility in an ultra-smooth full-flat brushed aluminum and magnesium chassis. Available with a 13.3-inch display, the new VAIO T Series features the latest generation Ultra Low Voltage Intel® Core™ processors. The Ultrabook comes with an optional Solid State Drive or Hybrid drive, providing the best of both worlds, using new Intel® Smart Response Technology. With all the built-in ports and connectivity that other Ultrabook laptops may lack, the VAIO T Series is made for business with two USB ports including a charging function for mobile devices, HDMI® out, VGA, Ethernet, Memory Stick® and SD Card Reader for easy connection to monitors, projectors without the need for a dongle. Ideal for students and everyday users, the easy-to-use VAIO E Series features a new wrap around design. 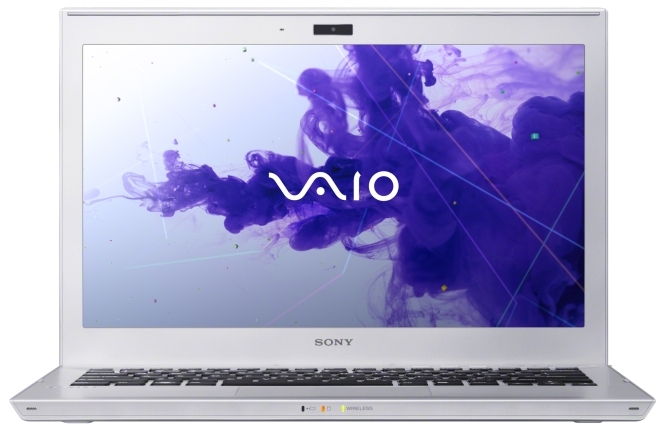 Available in 11.6-inch, 14-inch, and the 15.5-inch models, which feature an Aluminum design with a diamond cut VAIO logo, the PCs include backlit keyboards (14-inch and 15.5-inch), smooth graphics and clear high contrast display and AMD Radeon® graphics. The 11-inch model comes with an AMD processor, the 14-inch comes with second-generation Intel® Core™ processor and 15-inch is available with a variety of second and third generation Intel® Core™ processors. In collaboration with entertainment icon and GRAMMY® Award-winning artist LL COOL J, Sony offers the exclusive VAIO E 14P bundle in red and black wrap design featuring Boomdizzle's MyConnect Studio Technology, allowing multiple artists and musicians to record, edit and produce new music together in real-time from anywhere in the world. The completely web-based software eliminates the geographical and economical barriers for musicians. The bundle also includes Dolby® Home Theatre v4 Audio Technology and Sony MDR-V55 DJ style headphones styled to match. The S Series continues to offer the best combination of mobility and performance and all around excellence in a full-flat elegant design. Crafted in tough, weight-saving magnesium, aluminum and carbon fiber materials, the 13.3-inch and 15.5-inch models feature everything students and performance minded users need including standard voltage processors, NVIDIA® Graphics with up to 2GB of VRAM, Optimus™ Battery Technology, different Hard Drive and Solid State Drive options, slot-in optical drives (Blu-ray Disc™ options as well) and backlit keyboards. With the third generation of Intel® Core™ processors now available, the S Series models will both be available with up to Core™ i7 and the 15-inch supports an i7 Quad Core™ processor, delivering even more performance automatically when users need it. Options for QUAD RAID 0 technologies are available on both the 13-inch and 15-inch S Series laptops. Security is enhanced and made simple with TPM and Fingerprint Reader and fourth generation Hard Disk Drive Shock Protection Technology (Free Fall Protection Sensor and Axis Change Sensor). High contrast display features multiple resolution offerings, enhanced scratch resistance and anti-reflective coating to minimize glare plus different resolution options. The larger 15-inch screen-size model features a Full HD (1920 x 1080) IPS Display, offering super wide viewing angles for high-impact images when sharing projects with clients and colleagues. Available as an option is a new docking station for the S Series to maximize power. An integrated 500GB hard disk drive backs up files automatically in order to add more storage. Also, when coupled with the advanced large-capacity optional sheet battery, users can be mobile and unplugged for up to 12 hours with the 15-inch and up to 14 hours with the 13-inch model while also offering a thin battery profile. Intelligent charging enables VAIO S Series users to charge the optional sheet battery separately from the PC and attach it to the system at any time without shutting down for maximum flexibility. Designed for the multi-tasking business professional, the VAIO celebrates its 15 year anniversary with an exclusive glossy carbon fiber Z Series Anniversary edition. 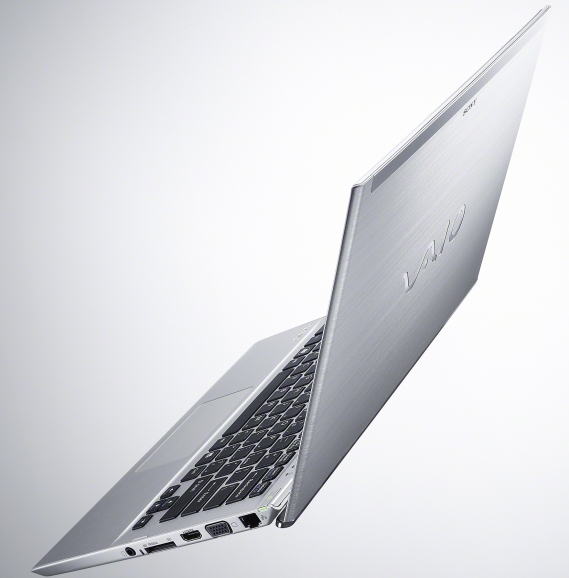 Carbon fiber materials provide the VAIO Z with a durable and sleek casing, while maintaining a slim 2.6-pound weight. A Full HD Display (1920x1080) assures rich colors and a wide viewing angle while anti-reflective technology cuts distracting reflections when working under direct lighting. The fastest notebook ever from Sony, the VAIO Z uses Solid State Flash RAID drives to store files and access data and is now available with third generation Intel® Quad Core™ processors. The Power Media Dock drive further expands the capabilities of the VAIO Z providing unparalleled convenience for the business user in need of additional ports or external displays. When paired with the dock, the Z Series transforms into the ultimate workstation and can support up to three external monitors. In addition to performance, looks, mobility and expandability, the VAIO Z includes I/O port connectivity and Sony's unique Sheet Battery technology. 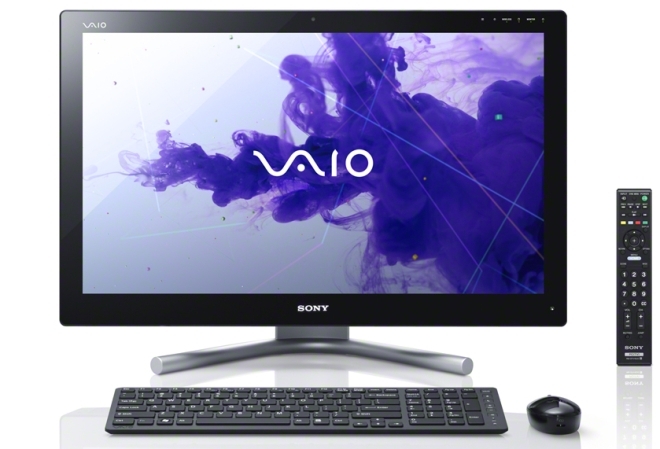 Powered by Sony's BRAVIA Engine with the X-Reality™ chip for amazing picture quality, the new VAIO L Series All-in-One is a contemporary high-definition PC/TV with a stunning full flush 24-inch (diag.) LED backlit multi-touch display, offering intuitive touch access to the Internet, Blu-ray Disc movies, music and photos. Built for multitasking, the new VAIO L Series All-in-One includes a TV Tuner with picture in picture functionality, allowing users to watch TV while on the PC. The L Series is available with the third generation of Intel® Core™ processors, supporting up to i7 Quad Core™, Slot load DVD and Blu-ray Disc™ options, 1, 2, & 3TB hard disk drive options and NVIDIA Graphics options. A glasses-free 3D option will be available late summer 2012. Created for those who demand the highest levels of design and performance, Sony brought its prowess in developing leading BRAVIA® televisions, audio, digital imaging and software technologies to the new VAIO Series. The new models also offer high performance and include features ideal for casual users to innovations that are responsive to key business needs. Integrated stereo speakers utilize Sony's audio fidelity including Clear Phase™, XLoud™, S-FORCE™ and S-Master™ technologies, to deliver a richer, bolder and louder presence without distortion. A built-in HD web camera across all models offers superb video conferencing quality powered by an Exmor® sensor from Sony's award winning digital imaging division. PlayMemories Home™ Software makes organizing, editing, viewing and creating photos and videos in the cloud a cinch. The new line also features the Sony Creative Software Suite, a $200 plus value that includes award winning Vegas™, Acid™ and Sound Forge™ programs. Featuring Sony's own Rapid Wake technology, the PCs resume from sleep status in two seconds after opening the lid all while keeping data safe and secure and maintaining a long battery life. A Full HD Web camera powered with Sony's industry leading Exmor digital technology is included across all new models. Precisely engineered keys create a comfortable and intuitive typing experience in dim light (not available in E11 and T13). The new VAIO Series models make a handy charger if there is no AC socket nearby with a USB 3.0 charging function. Just plug a mobile device via USB in any of the models and start charging even if the PC is shut down and unplugged. 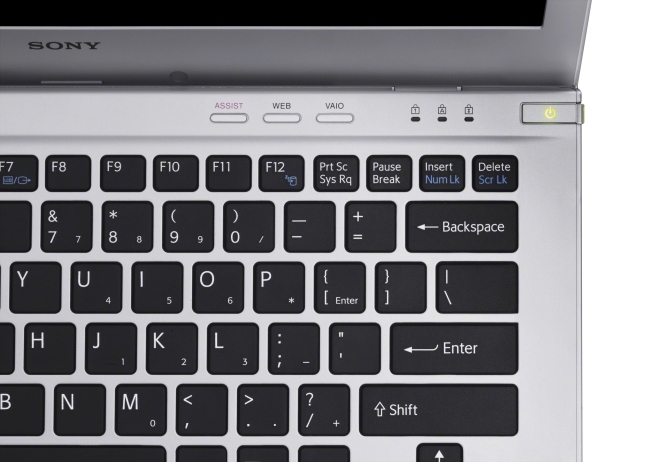 An easy-to-use large multi-gesture track pad is the most intuitive way to interact with the new VAIO models. Scroll with two fingers, pinch to zoom in and out of images, swipe to flip through pages or photos. Also included in all the new models is the VAIO Gesture Control function allowing users to control many applications and programs such as PowerPoint® and Windows® Media Player by making hand gestures in front of the Web camera to skip songs, turn pages, or control the volume. All VAIO PC's include worldwide service and support including local in person tech support and the newest version of VAIO Care™ software, an easy-to-use tool that tunes up, updates and troubleshoots the VAIO PC. The new VAIO line will be available June at Sony retail stores (www.store.sony.com) and other authorized dealers nationwide. • E Series 11 will start at approximately $449.99 in Sharkskin Black and Seafoam White. • E Series 14 will start at approximately $549.99 in Sharkskin Black, Seafoam White and Seashell Pink. • E Series 14 Premium will start at approximately $699.99 in Black with Burgundy Red, White with Aqua Blue and Gunmetal with Vintage Gold. • E Series 14 Premium Boomdizzle Bundle will start at approximately $899.99 in Black with Burgundy Red. • E Series 15 will start at approximately $449.99 in Aluminum Silver, Sharkskin Black and Seafoam White. • T Series 13-inch will start at approximately $799.99 in Silver Mist. • S Series 13-inch will start at approximately $899.99 in Black, Silver, White and Pink. • S Series 13-inch Premium will start at approximately $1119.99 in Carbon Fiber Black, Carbon Fiber Gold and Carbon Fiber Gun Metal. • S Series 15-inch will start at approximately $999.99 in Black and Silver. • L Series will start at approximately $1299.99 in Black and White. Sailing ahead with Blue Sea.